If you answered yes to any of these questions, Vectorworks can fix that, which is why so many architecture and design firms choose it as their go-to software for landscape projects. Vectorworks software can spot an issue before it becomes a bigger problem and offers you a quick solution, all while ensuring you meet your client’s needs. To give you a better sense of what this means, we spoke with three landscape design professionals who shared their experiences with Vectorworks software, and how it easily solved their design problems. Christina Speiden, director of sales and marketing at ProBuilt Construction, knows the ins and outs of residential landscape design and the difficulties that come with it. Her company specializes in outdoor living environments, from design process to installation. Speiden shared a few road blocks she faced during the Maple Lawn community landscaping project in Fulton, Maryland, including difficulties related to a lack of privacy and shade and eyesores throughout the community. Many of the homes in Maple Lawn have detached garages, which can be accessed through a shared alleyway between houses. When the homes were built, there were no walkways provided between each house and its garage, meaning a homeowner would have to walk through the grass, in rain or shine, to access it. Speiden used the Vectorworks DeckWorks plug-in to design a tiered patio and breezeway roof to connect each home directly to its garage. Renderings of designs created with the DeckWorks plug-in, utilized in the Maple Lawn community. This plug-in offers everything a contractor would need to design a customer’s dream outdoor living space in 2D and 3D. It allows you to generate material lists, design to budget, create construction Gantt charts, and professional proposals. It also provides access to the Trex product line as pre-drawn symbols, including materials, furniture, and lights. Matthew Cunningham, landscape architect and principal of Matthew Cunningham Landscape Design LLC, specializes in residential work in Stoneham, Massachusetts. “We have built just about anything you can imagine with Vectorworks software to solve problems and hide eyesores with our landscape designs,” said Cunningham, echoing Speiden’s experience. Not only does his firm create the landscaping, but they also prepare drawings that “communicate every aspect of our landscapes, from decks, terraces, walls, and grading, to fencing, screens, and planting,” he said. Cunningham’s team had several problems to solve for one project, the Reservoir Estate. The client had a large family that wanted to make better use of their extensive outdoor space. Some of the solutions the design team brainstormed included the addition of sheds, AC enclosures, trash and recycling enclosures, an outdoor shower, utility screen, fountain, pool or spa, grill, retaining walls, extensive fences and gates, pergolas, and a deck. In the end, the Cunningham team gave the Reservoir Estate a total makeover, while making sure to satisfy the client’s love of family-oriented activities. So, what did they add? Upgrades designed by Cunningham’s firm. Images courtesty of Pacific Coast Land Design, Inc. Without the help of Vectorworks software, Cunningham would have had difficulty creating these stunning additions. The option to draw the designs online first helped him bring his landscaping vision to life. Our next Vectorworks success story comes from Eric Berg, CA RLA, senior associate at Pacific Coast Land Design, Inc., a landscape architecture firm located in Ventura, California that specializes in commercial, multi-family housing, and public works-type projects. Berg’s firm faced a potential obstacle when a client wanted to add a deck to an existing landscape, while preserving as many existing trees as possible in the process. In one corner of the development sat a beautiful rusty leaf fig tree that rested at the intersection of two natural circulation routes. The tree’s canopy was crucial to the appeal of the surrounding space. The only way to preserve existing trees in a construction site as complex as this one would be to preserve as many roots as possible. Typically, the construction of concrete or granite walks/pads—a common practice in the addition of a deck—requires intense excavation. 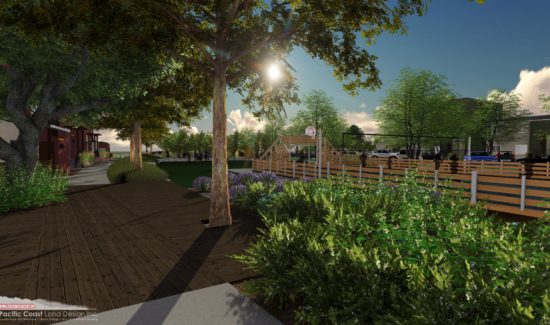 Berg and his team quickly solved this issue by using Vectorworks design software to design and propose the construction of a large deck that would only minimally affect the fig tree and allow them to use its splendid canopy to bolster the appeal of the surrounding open space. The design team used the 3D modeling capabilities of Vectorworks for the design and rendered the design with Lumion, which aided in the overall representation of the proposed deck and preserved fig tree. The design even offered a planter opening for if/when the client wished to plant an additional tree. Rendering of the deck buit around the fig tree. Image courtesty of Pacific Coast Land Design, Inc.
As evidenced by Speiden, Cunningham, and Berg, Vectorworks Landmark software offers creative solutions to streamline everyday tasks with industry-leading tools that enhance workflows. Visit our website to sign up for a free 30-day trial or continue learning about Landmark.